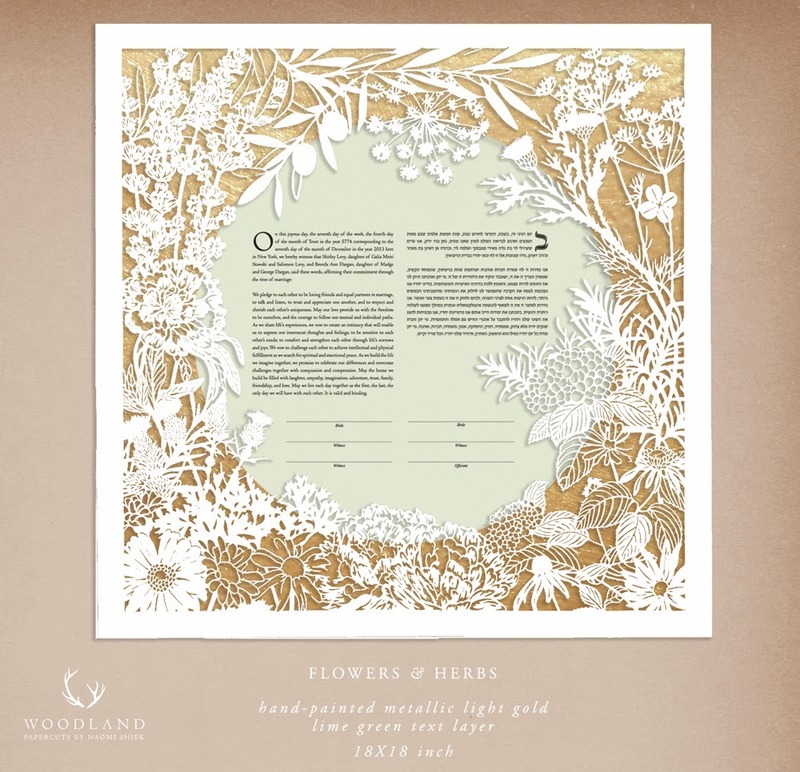 I don't have a good full photo of this ketubah, or a good digital preview for that matter, but you can get the idea. This one was a beauty! Commissioned by Shirley & Brenda in September, they asked for a circular ketubah featuring flowers & herbs that were dear to them: black eyed suzies, lantanas, peonies, olive branches, lavender, thistle, dill flowers, thyme, parsley, and one little 4-leaf clover for good luck. They asked that the coloring be gold and green and I think we reached the perfect combination with this metallic-light gold and mint green papers! They included a touching personal text that I translated. The couple is getting married today and I sincerely hope it's as personal & happy & loving a celebration as my communication with them has been! We received the ketubah on Thursday and it is INCREDIBLE. It has exceeded our expectations in every way. It's truly perfect. Thank you so much for being such a pleasure to work with, for accommodating our special request, and for delivering to us such an amazing work of art we'll have with us forever. YOU'RE SO, SO WELCOME SHIRLEY & BRENDA!